"There is a lot of talent in Bend. People who have never gotten to be in a gallery can get more connected and more involved now." You've probably heard the saying, "An artist is only as good as his tools." While talent does play a big part, having the right supplies doesn't hurt, either. Just ask Lacey Champagne, who contends that Bend had too few options before she opened Layor Art + Supply last fall. An artist herself, Champagne moved to Bend from Louisiana with her husband. As someone who consumes her fair share of art supplies, she saw a hole in the Bend art scene: The only art supply stores were actually more like craft stores—which she says are fine if you want to dabble in a new craft, but leave a lot to be desired if you're looking for a certain kind of paintbrush or that perfect shade of green paint. "I saw the need for an art store, and I wanted to give that to the community," Champagne explained. "It's nice to have a premium art supply store [in town] because shipping is a big cost." Layor is a place where artists can buy supplies, but it was important to Champagne that it was also a place for them to expand their horizons and see all sorts of art by other people, she said. "I wanted to have a platform for other artists, because it's really inspiring to share art not just with yourself but with others," she explained. "You constantly get to grow and challenge yourself when you share your art with other people." When she started elementary school in Louisiana, Champagne tested a program called Talented Art, where she got to leave her classroom for two hours a day to learn about the fundamentals and foundations of art. The program was amazing, she says. "The techniques are advanced and for me it was a dream because I learned drawing foundations at a younger age and went on to paint in oil and acrylic as a teenager," she said. "From there I found my own voice using acrylic and oil in more of an abstract form." After high school, she took some classes at the University of New Orleans and then opened a gallery on the edge of the city. 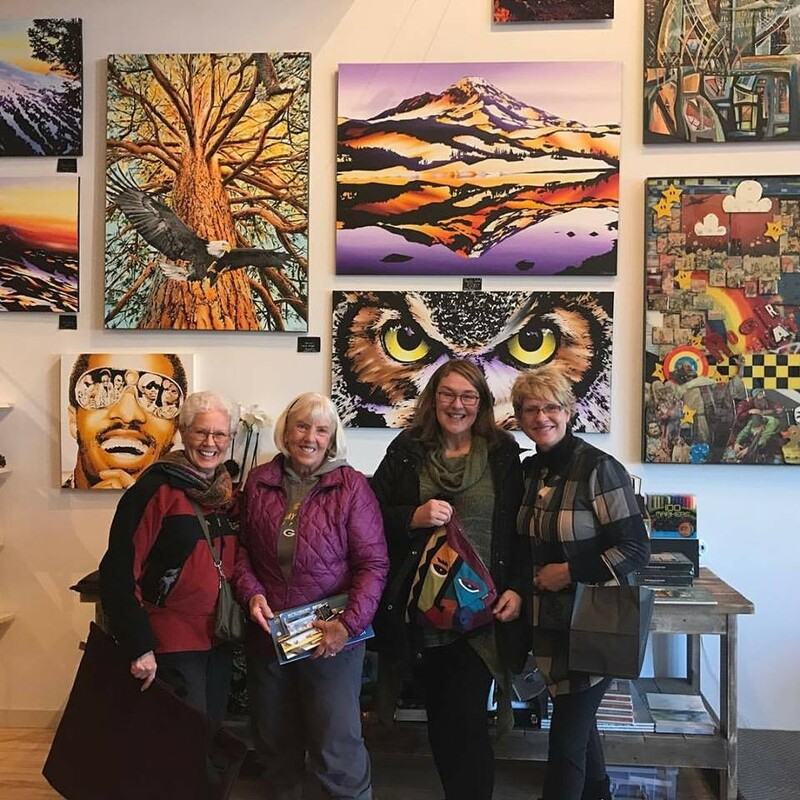 Although she and her husband liked living there, she said they were happy to move to Bend and live in a place with beautiful scenery and four distinct seasons. Champagne said it has changed her art. "The textures and the landscape are so diverse," she said. "It's a different environment. The people are so sweet and it's a really comforting place to live—it makes me feel at ease. New Orleans was really chaotic but here I feel really grounded." These days Champagne enjoys working on large canvases and said she has been experimenting with adding texture and sculpture to her paintings. The art on her website is full of color, and even though you're viewing it on a flat screen, the texture is eye catching. Champagne has been interested in art since she was a child, and while she says she always wanted to be an artist, she was also interested in creating a place where artists could display their work and be inspired by other work they saw there. Some local artists, including Erik Hoogen, felt that before Layor opened, it was almost impossible to get their art displayed around town. "Lacey has sold more art of mine that anyone else," Hoogen said. "I've been an artist for eight years, and Lacey gave me hope that I could survive in this town." 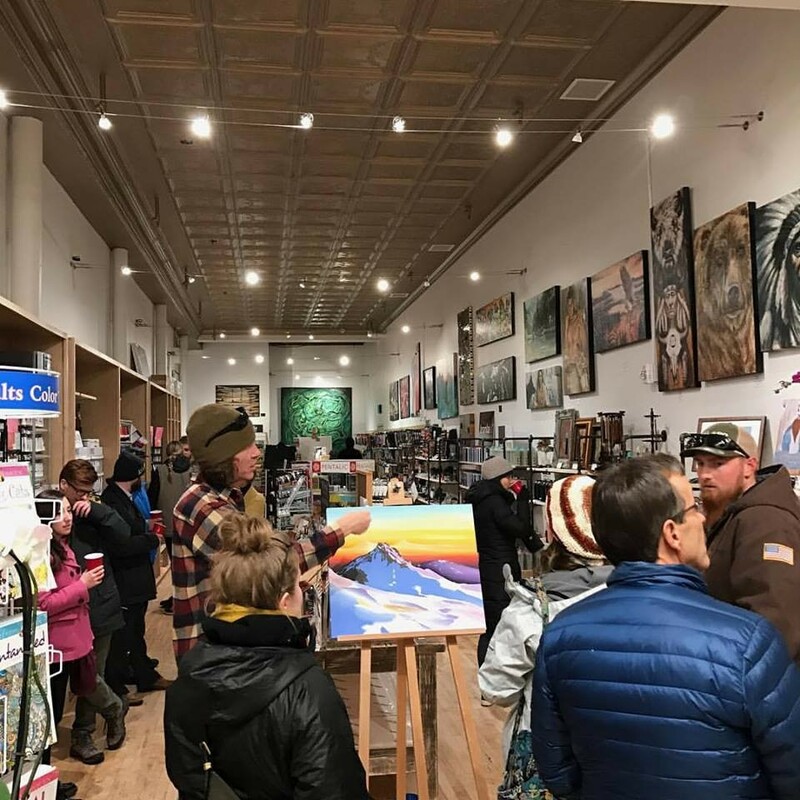 Hoogen's art—large, vibrantly colored mountain scenes—is currently visible through the front window of the store. "There is a lot of talent in Bend," Champagne said. "People who have never gotten to be in a gallery can get more connected and more involved now." In addition to bringing in premium supplies, Champagne is literally giving the walls of the store to artists in town. The team rotates the store's displays for every First Friday, always featuring local artists. In March, students from Summit High School had their art on display, featuring works that included prints, pottery and paintings. Last month the art was made by artists from the Sagebrusher's Art Society, a local art club. In June you'll see art by Ken Marunowski, who works mostly with oil paints, sometimes painting outside, "en plein air," using bold, expressive brushstrokes. Although running a business isn't an easy task—especially when you're tasked with picking what products to sell, Champagne said it's been totally worth it. "I can't say I'm getting tired of it," She said. "Besides my husband and my family, this is what I love the most."